This giclee Print is an open edition, signed by the artist. The size is 22" x 28" that includes a 2" white border. 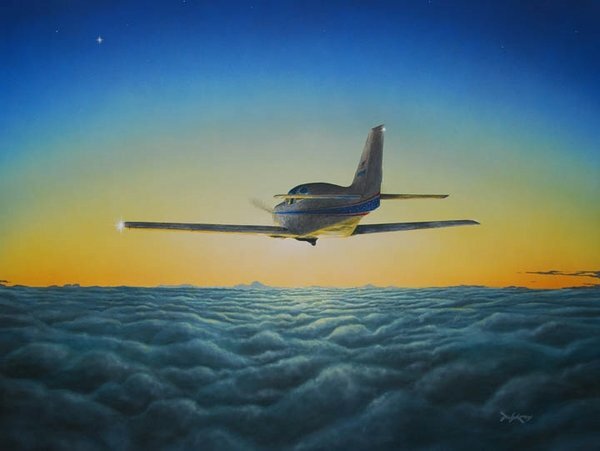 VFR on Top During a Sunset is One of the biggest thrills for any general aviation pilot is known as VFR (Visual Flight Rules) on top. Even better is flying above the clouds during a spectacular sunset (or sunrise). This image depicts a single-engine, Glasair aircraft flying towards the sun in such a situation.